A Rinkya Blog: Geta Stacking Contest in Japan! 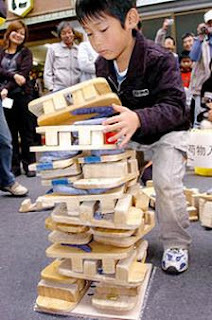 A 3rd Annual Geta Stacking Contest took place over the weekend in Sakaiminato, Japan. The "teeth" on the bottom of the shoe are used to stack the getas up high in the contest shown above.